I am getting pretty picky when it comes to purchasing toys for my kids. They have a lot of plastic stuff that they love, but I don’t really think they need any more of it. These days I seek out toys that are not only fun but are educational. When it comes to educational toys, I find myself looking for things that help inspire STEM education. STEM stands for Science, Technology, Engineering, and Math. Basically, STEM educational products are designed to encourage kids to develop core skills in these areas. Lots of schools are offering more and more STEM immersion in their daily instruction. As the need for technology, science, and math increase, our kids need to be able to adapt to it and be able to work with it on a daily basis as they get older. Seeing as how the earlier you learn how to do something the easier and better it becomes, we try to introduce these concepts to our kids early on with age appropriate activities. Recently we were sent a SPRK+ Robot Ball by Sphero Lightning Lab from Best Buy for my son to play with and found it to be a great way to introduce my son to the concept of coding. 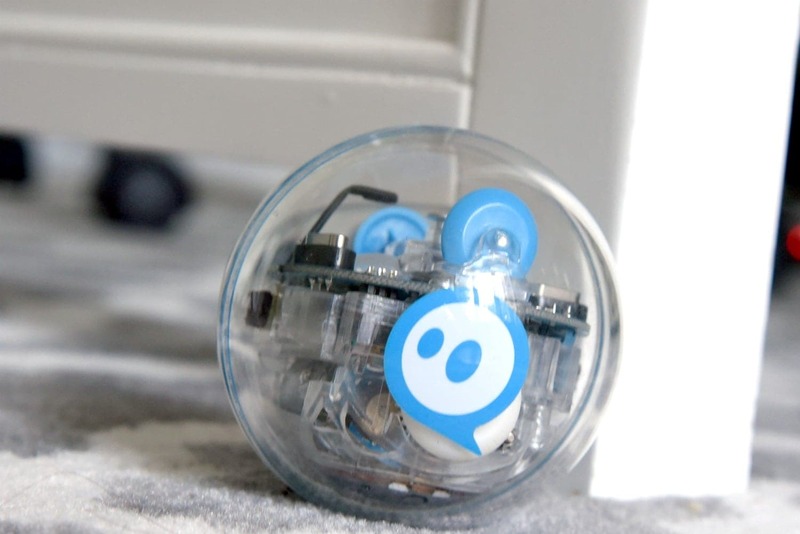 Designed to inspire curiosity, creativity, and invention through connected play and coding, SPRK+ is far more than just a spherical robot toy. SPRK+ comes with the Sphero Robot, a charging cord, and some Maze Tape. You will need to download the Learn Lab app onto a compatible device in order to start using SPRK+. 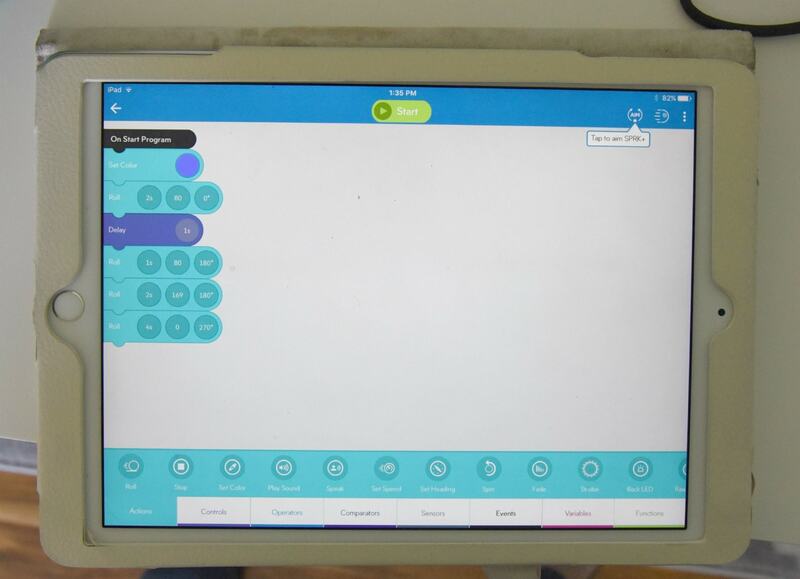 The Lighting Lab app allows anyone to program SPRK+ with basic controls all the way to some advanced coding. If you have a young child just learning how to code, SPRK+ is a great tool to advance their skills. Using the app SPRK+ can run a maze, paint, swim, have a dance party, participate in a chariot challenge and much more. The app allows the user to move the sphere in many different ways, speeds, and positions. You can control the color, sounds and lots more making it multi-purposeful appealing to many different ages. You are even able to share what you have created with the community if you choose to do so. SPRK+ is a great toy to play with in the house or on the go. Seeing as SPRK+ is waterproof, you could even play with him in your pool. I wouldn’t recommend bringing him to a public pool, but if you have access to a private pool he would be a lot of fun to play with. SPRK+ is a great way to infuse classroom-type learning outside of the classroom. We have all heard about the summer slide where kids forget about 20% of what they have learned in the 10 weeks of summer. Why not keep their brains motivated with SPRK+. SPRK+ is a fun way to keep learning outside of the classroom environment. It won’t feel like learning, it will feel like fun! SPRK+ is recommended for ages 8 and older. My son is 8 and we have just done the basics with SPRK+ so far. There is a lot of the math things that we haven’t gotten into yet. I can see a lot more of that in our future as he starts third-grade math this next school year. I think 8 is a great starting point for this robot. For younger kids, I would recommend looking into Dash by Wonder Workshop. Best Buy carries products from basic learning games to advanced toys designed to stimulate a child’s mind in the STEM areas, helping to develop logic and problem-solving skills. Be sure to check out all the great STEM products that they offer. Learn more here!